The Province of Batangas’ three cities had mixed fortunes even as the province itself soared from 20th to 9th among 74 provinces in the 2016 Annual National Competitiveness Index. The calculation of the index is an undertaking by the National Competitiveness Council of the Philippines in coordination with Regional Competitiveness Committees and USAID. The 2016 results were released last 14 July 2016. The rankings are calculated on the basis of the three pillars identified by the national council to measure competitiveness: economic dynamism, government efficiency and infrastructure. The annual index is intended to be used as a guide for businessmen to ascertain the competitiveness of local government units. This article is based on the overall rankings of 142 cities regardless of category. 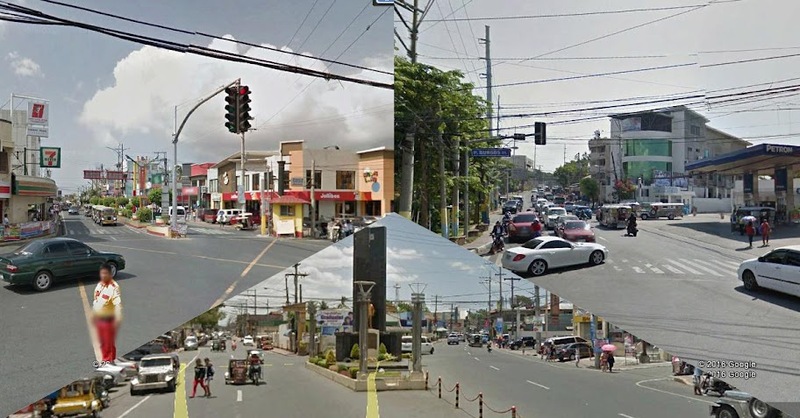 Batangas’ three cities scored better in the 2015 index than in the latest one. Despite this, however, Tanauan City jumped five places to rank 33rd from last year’s 38th. Batangas City, meanwhile, moved up four places to 43rd from last year’s 47th. Only the City of Lipa dropped in terms of ranking, stumbling down 22 places from last year’s 61st to 83rd. * Of 142 cities in the competitiveness index. Lower bar is better. All three cities of Batangas improved on their scores last year in this area. 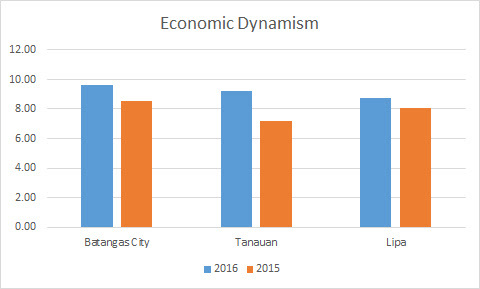 Batangas City retained its position as the province’s most economically dynamic city; but Lipa’s position at second last year has been taken over by Tanauan City. Tanauan’s score of 9.19 is 1.98 points higher than its score last year, the biggest gain among the three cities. Batangas City only improved by 1.05 points from last year’s 8.57 to this year’s 9.62. Finally, Lipa improved by 0.67 points to 8.75 from last year’s 8.08. Batangas’ three cities all fared better in 2015 than this year in this area. Lipa City fared worse by 6.64 points from last year’s 17.90 to 11.26 this year. Thus, the city dropped from second last year to third this year. 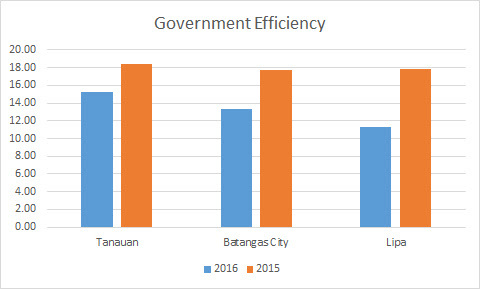 Tanauan continues to lead the way in terms of government efficiency with 15.31, although it also dropped 3.05 points from last year’s 18.36. Batangas City climbed to second with 13.30 points, 4.49 points less than last year’s 17.79. 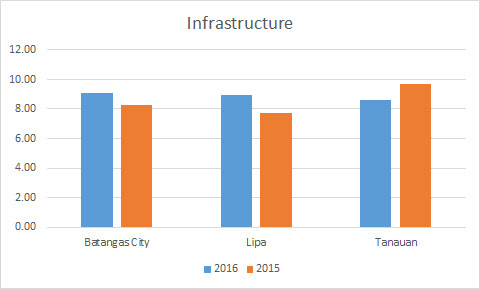 Tanauan dropped from first last year to bottom this year in terms of infrastructure, scoring 8.59 points compared to last year’s 9.70, a loss of 1.11 points. Batangas City took over first place in this area, scoring 9.07 points, a 0.82 point gain over last year’s 8.25. Lipa kept its place at second with 8.95, posting the best increase of 1.20 points over last year’s 7.75. 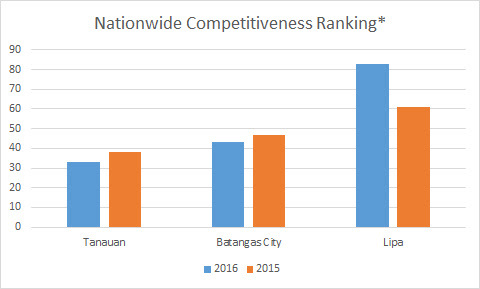 There are no changes in the provincial rankings of Batangas’ three cities in terms of overall competitiveness, although as already mentioned all three cities performed better in the 2015 index. 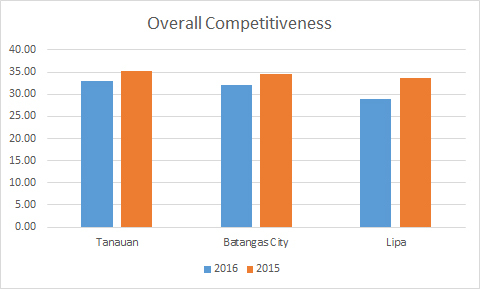 Tanauan retained top spot as Batangas’ most competitive city with a score of 33.08 points, 2.19 less than its own score in 2015. Batangas City scored 31.99, 2.62 points less than last year’s 34.61, to stay at second place. Lipa stayed bottom among the three cities, scoring 28.96 points, 4.78 less than last year’s 33.73. For those who wish to verify the data contained in this article, please follow this link to the Cities and Municipalities Competitiveness Index. It may be worth everyone’s while to bear in mind that the data and rankings provided are not a competition but, as mentioned, a guide to businessmen.